In case your regular physician or anyone else (your insurance company) scoffs at the idea of using holistic / integrative therapies “because there’s no proof,” print out this handy sheet and hand it out. The proof comes in compiled research that shows not only do integrative options often offer better health outcomes, they can often cost less than conventional options. If you are a company’s HR or healthcare manager (or even an employee), you might want to know “Really? 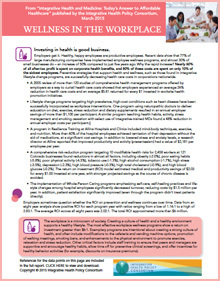 By how much?” The data (our numbers) have been out there, but not until recently pulled together as they are in this single sheet entitled “Wellness in the Workplace,” which summarizes the research into this very question, and presents compelling statistics. A program in which naturopathic doctors educated patients on diet, exercise, stress reduction and dietary supplements resulted in an annual employer savings of more than $1,100 per participant. A similar program that taught health habits, activity, stress management and smoking cessation that included MDs trained in integrative medicine saw a 48% reduction in annual employer costs per participant. Published in March of 2015, and written by the nation’s top researcher in the field, the report shows the advantages of acupuncture, massage therapy, naturopathic medicine and chiropractic when used to treat a variety of conditions and when in used in concert with conventional therapies, as in the examples above, which you see are heavily oriented to lifestyle improvement. One of the reasons that CoverMyCare insists that Section 2706 be adopted across the country is that integrative therapies and approaches to care are not only great treatment options, they often cost less than standard care. For chronic illness that could require costly symptom management over many years, this can make a huge difference. 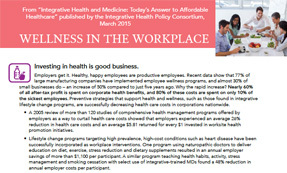 “Wellness in the Workplace” shines a light on the numbers that reveal these facts of integrative life. Are there numbers for regulated health care providers like homeopaths, or Chinese medicine.